Balunen som kan skicka komposit och stereo ljud upp till 670 meter via en enkel Cat 5 UTP nätverkskabel och samtidigt skyddar mot så kallat "jord brum" med hjälp av en Ground Loop Isolator. The Stereo Hi-Fi/Video GLI Balun (500039-GLI) allows a single composite video signal to be transmitted via unshielded twisted pair (UTP) cable up to 2,200 ft (670m) in a point-to-point connection. The Stereo Hi-Fi/Video GLI Balun features full audio bandwidth response for high fidelity applications and features Ground Loop Isolation (GLI) to help eliminate "hum" bars. 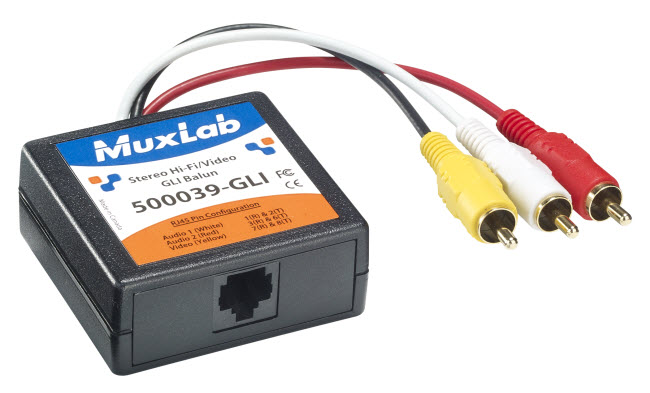 Only one 500039-GLI is required per connection and may be used in conjunction with the 500001, 500039 and 500200. The 500039-GLI is recommended where ground loop issues are present or of potential concern and may be applied in applications such as residential, classroom and boardroom AV systems.